My name is Kaye and I live in the beautiful leafy suburb of Eaglemont in the most liveable city in the world, Melbourne, Australia. I live with my husband (TraderVic) of thirty-five years (eeks! Where did that time go?). I have three grown up children and a gorgeous daughter-in-law, who all live scattered around the world. DS1 and his wife have just moved to Brunei (on the island of Borneo) for a teaching job, DD lives and works in London and DS2, lives the closest to us, in Sydney, NSW. We have two furbabies: Furio and Milo (inherited from our children) who feature a lot on my blog, plus DS1’s cat, Nobu, lived with us for a year before being adopted by a dear friend of mine who was in need of a cat in her life just at the right time: when DS1 and DDIL decided that a new adventure in Brunei was waiting for them. 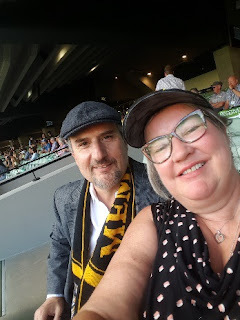 TraderVic and I at the footy (his abiding passion), barracking for the Mighty Tigers! I am an absolutely avid/besotted/obsessed (you pick the adjective) cross stitcher and blogger, although life does have a habit of getting in the way of the latter, so I do not blog as regularly as I would like to sometimes. My very first cross stitch project was putting red crosses on a blue gingham table mat for Needlecraft class when I was twelve. 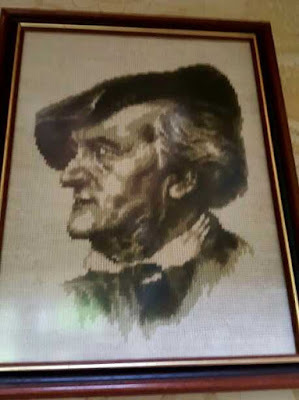 At that time needlework was not a great success for me as I recieved my only ever “D“ in the whole of my schooling for Needlecraft. So, I gave up on stitching and sewing for the next several years and took up my knitting needles instead. I went back to stitching sometime in my early twenties, when the long stitch craze began. 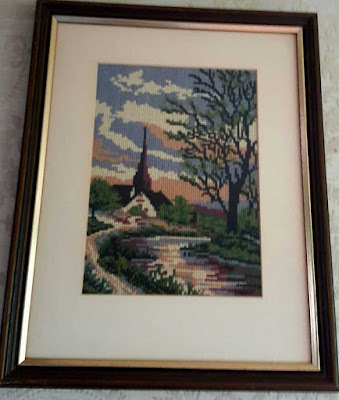 I did a few of those, a few tapestries and then went back to cross stitch. This was interspersed with patchwork, quilting, sewing (when I was home on maternity leave, I sewed many of my children’s clothes and costumes and even made a couple of fully-lined winter coats for myself), smocking and stamping – phew! 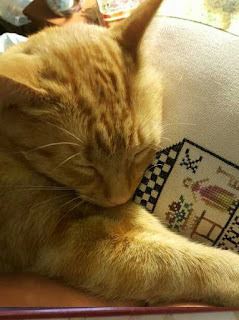 But, I must admit cross-stitch was always there and since I started my main blog, Kitten Stitching, in 2011, it has become an almost all-consuming passion for me. 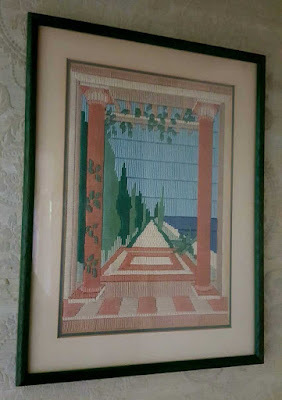 Here are a few of my early tapestry finishes, from the early 1980s. 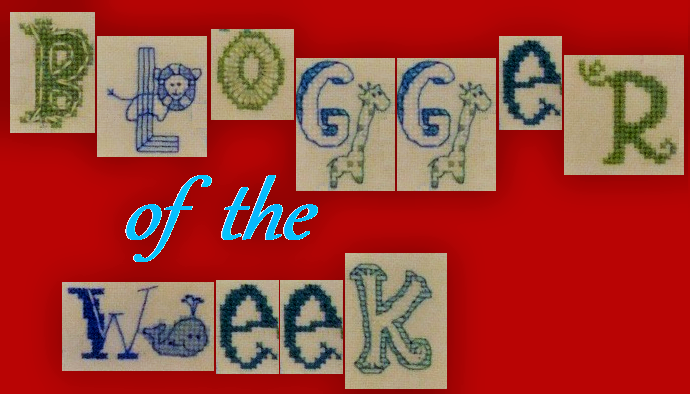 I have been blogging since 2011, when I started Kitten Stitching, and I was inspired by an online friend, Jayne, who really encouraged me to start my blog. Thank you, dear Jayne, you really changed my life. My blog title was inspired by the fact that I am a bit of a crazy cat lady and at the time our two cats were still kittens, and they love to sit with me while I stitch - hence the title. Furio is my stitching buddy. 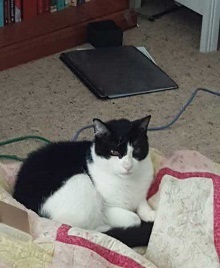 He cannot wait for me to sit and stitch so that he can snuggle up and have a good snooze. 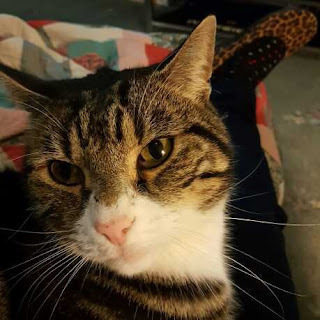 Milo, whilst rather a skittish cat, has lately taken to snuggling up on my lap, too. Kitten Stitching and the Friday Frolics – every Friday night you can pull out a WIP/UFO and stitch-a-long with me and other Frolickers. Christmas Ornie SAL – over each month you can stitch a themed piece and show off your finish on the blog. Americana SAL – For some strange reason, I have a real passion for Americana and American Patriotic Stitchery (maybe because I studied American History in Year 11 at school and loved it?). The reason it is strange is that I live in Melbourne, Australia, not in the U.S. at all – lol! So this SAL blog is for those of us who wish to indulge our patriotic passion – I try to stitch every Monday on something Americana – I call it ‘Merica Monday! Tudor Tuesdays SAL – I also have a real passion for the Tudors, which is why I started this particular SAL, although I must admit that I have been a bit remiss re my Tudor Stitching lately. Prairie Schooler SAL – This is a SAL blog I set up for those of us who love to stitch Prairie Schooler Designs. Although, I must admit, there has been no activity by anyone – not even me – on this SAL blog so far this year – oh no! NB: As the second half of 2017 was rather difficult for me – some of these SAL blogs have been a bit unloved but I am planning to rectify that in 2018! I am most definitely a Serial Starter, as I love, love, love starting stitching on a new design. Whilst I definitely try to be organised (with my SAL blogs, etc. ), I am a bit of a random stitcher – often just picking up a WIP or UFO that catches my eye to stitch on of an evening. Prairie Schooler, Little House Needlework, Country Cottage Needlework, Blackbird Designs, The Little Stitcher, Homespun Elegance, The Primitive Hare, Madame Le Fee, Mon Ami Pierre, Just Nan, Needlework Press and the list just goes on and on. 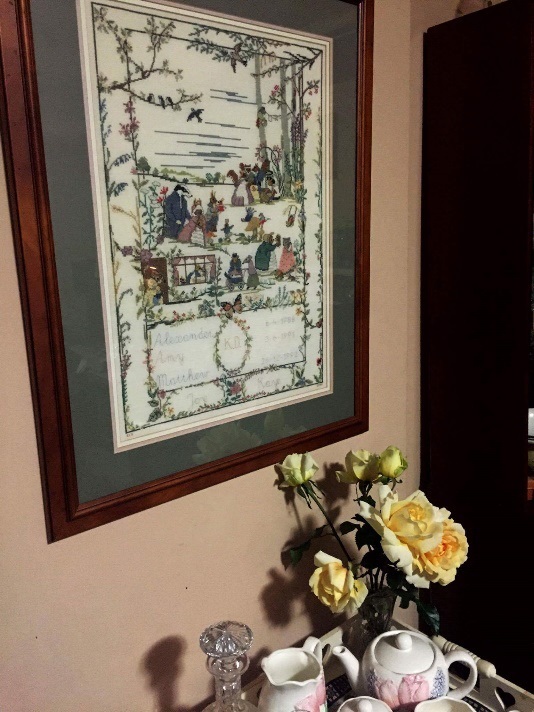 This would have to be my completed Wind in the Willows birth sampler – which I stitched to commemmorate the births of my three gorgeous children. At the moment, it would have to be my Cut Thru Castle by Bothy Designs. I made a mistake early on in the background and instead of biting the bullet and fixing it straight away, I kept stitching and stitching, thinking that I could somehow magic away the error by sheer force of will. But it has been bugging me and bugging me and now I am finally going to ditch it and think about starting it over again in a year or two, maybe! Nothing really – Cross Stitch soothes my soul. Oh boy, do I have a drawer full of finished-but-not-fully-finished pieces! However, I did make more of an effort to FFO in the first half of last year and plan to do more this year. At the moment, my two favourite ways seem to be small cushions and self-framing in photo frames. Hmmm! Not everyone might know this but while I HATE horror movies I ABSOLUTELY LOVE Zombie movies and TV shows - my favourite being The Walking Dead! I would just like to say thank you to our lovely hostess and my wonderful stitchy friend, Jo. She is such an inspiration to me – her stitching is always so wonderful and her finishes so inventive. She always picks the best designs to stitch and her blog hops are legendary and always so much fun. Thank you, thank you, thank you, dear Jo, for being my friend. Hello blogging friend....nice write-up. Thank you for sharing more of you! You are so welcome, Gracie, I had so much fun writing it. Oh Kaye, I loved seeing so many more pieces I have not seen before! Thank you, Vickie. So glad that this old dog still has some tricks up her sleeve and can surprise you. I know, I am so ashamed of that D but I suppose that I have redeemed myself by now - lol! So happy to be back in the blogging world, too. Kaye: Thank you for sharing a bit about yourself, your choices of stitching are beautiful. Thank you so much for the compliment, my dear. Waving to you Kaye ... lovely to learn a bit more about you. Waving right back, Julie. Thanks for visiting. Hi, Kaye! Nice to see you here and discover some new things about you, and I loved seeing more of your stitching. Thanks, Deb, I always Love to show it off - lol! Always nice to learn more about our fellow blogging friends! Really enjoyed reading through your interview, Kaye and seeing your lovely stitching (and I think I need to stop complaining about my son living 2500 miles away when your dear daughter is all the way up in London!!). Thank you, Carol, I am glad that you enjoyed the interview! Yes, it is all a matter of perspective, isn't it? DD is furthest away at nearly 17 000 km, DS1 is 5646 km away in Brunei whilst DS2 practically lives at home by living only 874 km away in Sydney - lol! It is nice to meet you. Will hve to go look your blog up! Thank you, Beth, please do! Thank you so much, my dear RJ. Very sweet of you. Thanks, Noni, finally got my act together for Jo! Great blog interview Kaye.I remember the long stitch emergence,not my thing but sil got into it for a while. Lovely projects you have shown here and also lovely to read about you. Thanks, Lesley - yes, it was a real trend for a while, wasn't it? Thanks, Christine - I suppose the gingham was cheap. I bet that you did better with your apron than I did with my plaecmat! It was fun to learn a little more about you Kaye. Thanks, Linda. I am glad that you enjoyed the interview. Thank you so much, Kay. Allo, Kaye, nice to learn more about you~ I envy all the classes for needlework, even with your spectacular grade. I suppose I would've gotten the same at the time though. So nice to learn more about you Kaye! You certainly have dabbled in a lot of crafts during your years. 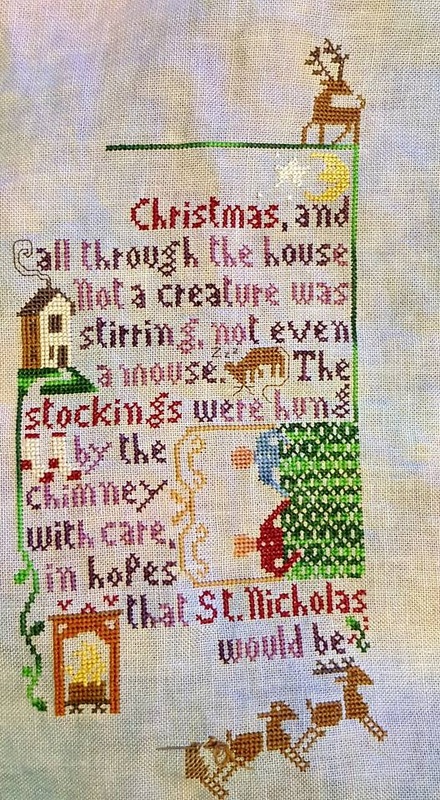 Your early pieces are amazing as is your Wind in the Willows birth sampler! Thank you, Faith - yes Wind in the Willows is my favourite piece ever! Lovely post , enjoyed reading it Kaye and getting to know you more. Thank you, June. Glad that you enjoyed the interview. Lovely to read about you Kaye. At last; I've found someone I 'know' who likes The Walking Dead! Kindred souls - at least the two of us will be ready for the zombie apocalypse! Kaye, it's so nice to learn more about you, especially how you selected your blog name! My cat lays next to me whenever I stitch, they are such great stitching companions. Your stitching is amazing and I enjoyed seeing your earlier works. I enjoy reading about all your travels, I confess I never saw Walking dead!! How nice to hear that you and Jo are longtime friends! Yes Jo and i have been online bloggy friends for a long time now - she is truly such an inspiration to me. Thank you for your kind words about my stitching. Lovely to read more about you Kaye, answering the questions for Jo brought back many memories for me and it's nice to see they did for you too. They certainly did! A lot of fun. Great answers. Thanks for sharing. You're so very welcome, Katie. Hi Kayle, nice to meet you! I visited Melbourne in December, so I can say I agree - it really does seem like a nice city to live in. Although I did not like the prices on stitching supplies at all! I think you might be the first non-American I meet who enjoys stitching Americana. Makes me feel less weird about really liking some of these designs! I hope to be able to contribute a bit more to your SAL blogs when I'm back in the swing of things. Oh, Brigitte, yes we are definitely stitching kindred spirits - hope to see more of your stitching online very soon. Lovely to learn more about you Kaye - and great to find a fellow zombie fan and Needlework "D"! How awesome that you still have so many of your early finishes. My 9 year old son enjoys long stitch but it's not as popular as it was back in the day! Kaye you have been an inspiration with your talents and your vitality.So many beautiful works of art!AriadnefromGreece!